You are searching for a bed during the Ende Gelände action days in October? If you need a place to spend the night for the campaign weekend from 25 – 29 October or already in the days before, our Accommodation platform will be happy to help you. People in Bonn, Cologne and the surrounding area offer private sleeping accommodations on our Accommodation platform . You can search there for these offers and get in direct contact with them! If there is currently no suitable offer, you can submit a request yourself, so that locals can write to you and invite you. You can also search for sleeping places for several people (e.g. your affinity group) at once. Please be prepared to spend perhaps one night in a big tent during the Ende Gelände action days in order to be as flexible as possible. It is important to bring your own sleeping bag, mattress and warm clothes. Sleeping bag and sleeping mat are also necessary for most of the other accommodation options. You think about offering a bed to someone? Support the climate justice movement by providing your couch, living room or some flooring for our guests in the next weeks and/or on the last weekend of October for the Ende Gelände action. Please use our Accommodation platform. There you can enter your offer and also respond to requests yourself. Please share this call in the social media and tell your friends about this action! We want all guests to find a good place. THANK YOU for your help! From 14 October onwards RWE wants to start clearing the remaining part of Hambach Forest, which has become the central symbol of the climate justice movement. Since the beginning of September, the occupation of “Hambi” has been cleared, activists who work for climate justice have been criminalised and trees have been felled. 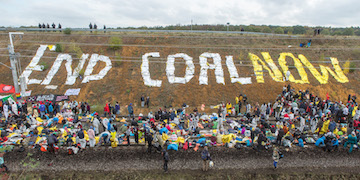 At the same time the coal commission meets in Berlin, which is to present a plan for the coal exit by the end of the year. In this decisive year for the “Hambi” and the coal exit in Germany, Ende Gelände will block the Hambach open-cast mine and thus protect the Hambach forest with thousands of people from 25-29 October. With our demand for an immediate exit from coal mining we will further increase the pressure on the coal commission. The climate movement is growing and it is international. Therefore we expect many newcomers who have to sleep somewhere. The available gyms will not be sufficient. We would like to organize relaxed, simple sleeping accommodations for the arriving activists, where they can stay during the weekend. Feel free to write to sleep@ende-gelaende.org if you have any questions. We see each other in the Rhineland! PS: Opening your own apartment for others is great and offers the opportunity to get to know exciting people – at the same time we can keep in mind that we are becoming more and more interesting as a movement for surveillance organs … so just make sure you put very private things etc. in a drawer.